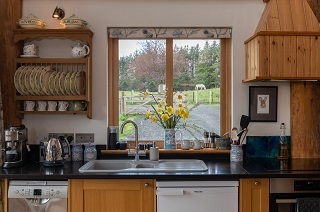 Country cottage, self-catering retreat in Scottish Borders. Winners of the Best Sustainable Tourism Exemplar (2011) and the Gold Award for having the most Sustainable Self Catering Business in the UK 2012). Two high end touring E bikes to rent for guests wishing to have a car free holiday. 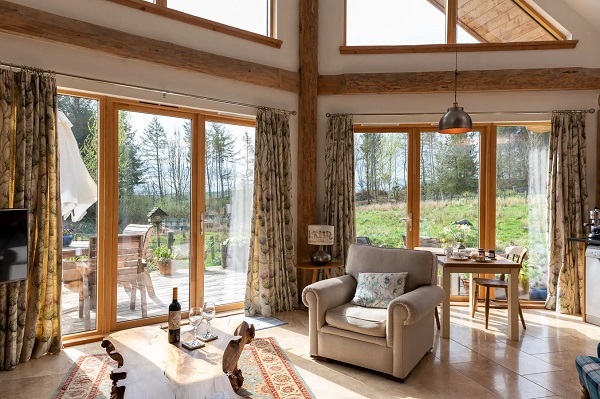 Fiddle Hill Cottage is a truly eco friendly romantic rural retreat, a dramatic new building using local Douglas Fir with larch cladding, highly insulated and powered by renewable energy - it is a very special place to stay and get away from it all. The ‘Best Bed in the Borders’ is made from the same logs, high off the ground and the comfiest bed you will ever sleep in. Inside will surprise you with much use of old and hand made furniture, good artwork and a kitchen with granite worktop designed for those who love to cook. 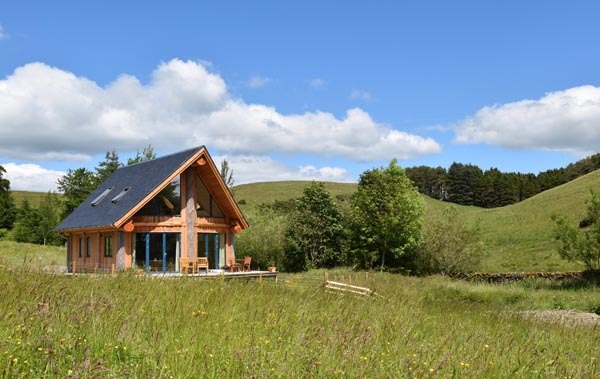 The Scottish Borders are a wonderful area for walking, cycling, mountain biking, bird watching, fishing and history and the cottage is ideally placed to explore this beautiful part of Scotland. 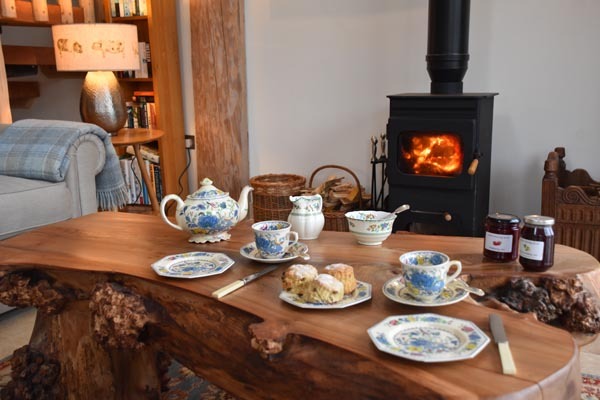 The cottage is also a perfect place to just relax - read by the fire, stroll up the hill to admire the stunning views, or sit by the fire pit and watch the stars on the wrap around decking. The area is a haven for nature lovers and there are regular sightings of goldcrests, bramblings, greater spotted woodpecker and red poll, plus huge numbers of the more usual garden birds. There are resident moorhens and tawny owls while herons visit the ponds regularly and, in the evening the local badgers can easily be seen rumaging around on Fiddle Hill. The owners have pigs, sheep, a Highland pony, ducks and chickens on the croft and grow much of their own food in a huge poly tunnel which they are happy to share - the welcome pack has a very low carbon footprint, and can include a beef stew made from their own home grown beef in the oven for your arrival. Hawick is well known for its mills and cashmere shops, rugby and the annual Common Riding Festival. It also has good restaurants, shops, pubs with live music and a cinema and heritage centre. Easily reached are the Border Abbey towns, castles and historic houses and gardens or take the Borders Railway to explore Edinburgh and all the attractions of the capital city. However, many people don't venture far from this idyllic rural retreat! 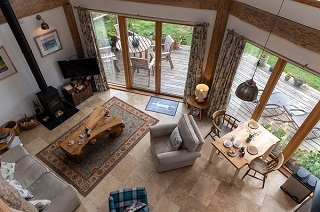 If you are seeking a car free break then the owners will pick you up free of charge from Tweedbank station, the last stop on the Borders Railway and less than an hour from the heart of Edinburgh. 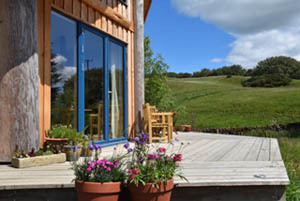 There are 2 Ebikes (electric bikes) for guests to hire at Fiddle Hill Cottage - they have a range of 70-100 miles a day and have panniers so are ideal for shopping and exploring the area without a car. 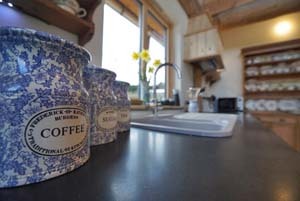 Fiddle Hill Cottage is newly built from local trees as a sustainable holiday house - the perfect romantic rural retreat. 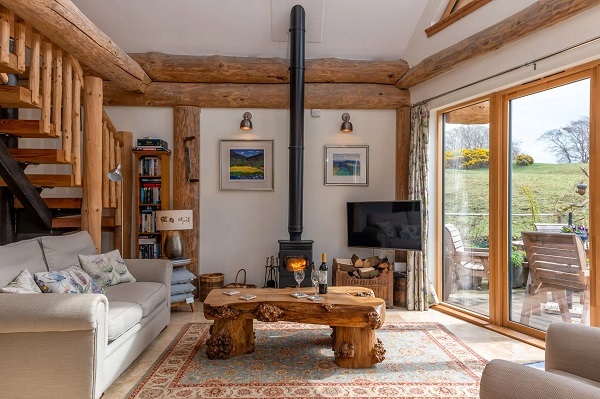 The dramatic open plan living area is extremely comfortable with a woodburning stove and double height windows looking over the ponds, garden and extensive Borders rolling hills. The furniture is a delightful mix of old and new, much of it hand made and there is lots of good artwork mainly by Hamish MacDonald and a local artist. The kitchen has a granite work top and is very well equipped for serious cooking. 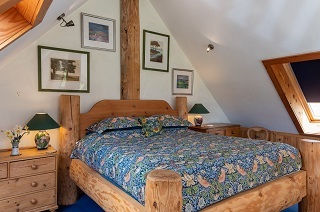 On the mezzanine floor is a super king sized log framed bed with a British wool duvet and pillows. 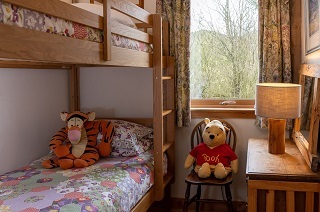 Although the house has been designed as the prefect romantic rural retreat for two, there is a small bunk room downstairs - sturdy wooden bunks (creak free!) and the top bed is much higher then normal so you can sit on the bottom without banging your head. 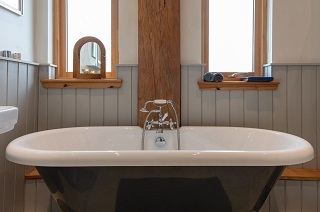 The bathroom has a roll top bath and a walk in shower and local hand made soap is provided. There's underfloor heating and the highest level of insulation so it's very warm and cosy, even in winter. Outside is a large wrap around deck with a barbeque and fire pit - a lovely place to sit out and watch the unpolluted night skies. You can buy meat, eggs and fresh produce from the owners' small holding, and also order a delicious casserole (made by them from their own ingredients) to be left in the oven for your arrival! From the south take the A7 and a mile north of the Homebase roundabout on the outskirts of Hawick turn left up a single track road signposted East and West Boonraw. From the north 7-8 miles south of Selkirk turn right go for about 2 miles straight on at the slightly wiggly crossroads past a farm on your left and down a very steep hill. The driveway is just after the bottom of the hill on the right and just before the grassy triangle and road junction. Heating and logs for the fire are included. Welcome pack including the owners' homemade jam, marmalade, scones and organic bread, together with Fairtrade tea, coffee and sugar. Change over day is Friday - check out 10am, check in 4pm usually but if we can be flexible then we are! 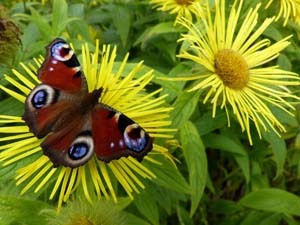 We welcome long weekend breaks of 3 nights from Friday and a mid week break of 4 nights from Monday. Weekend and short breaks are available. 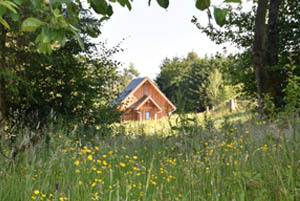 To book this eco friendly rural retreat in the Scottish borders, click the enquiry button below and see availability and rental rates. Fiddle Hill Cottage, Priestrig Croft, by Hawick TD9 7NT Scotland. 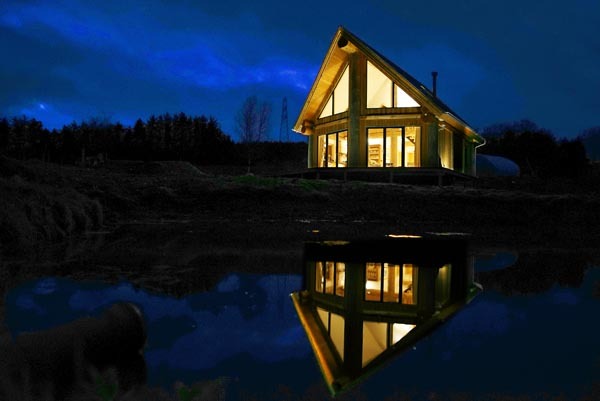 A stunning newly built sustainable holiday house near Hawick is perfect for short break or longer holiday. It is in an idyllic spot with birds and wildlife all around - if you want to explore the area then the Borders Abbeys, cycling, fishing, castles and cashmere shops are all nearby adn there is electric bike rental available! Perfect for a honeymoon too!